National Steel Car built NS&T 16 in 1918. This 50-ton freight motor was acquired from HEPC in 1926. Its number on the Queenston Construction Railway is not known, but it joined the NS&T as the second Number 16. (The first 16 was sold to the Montreal & Southern Counties in 1925, but returned to the NS&T in 1936 as Number 19.) 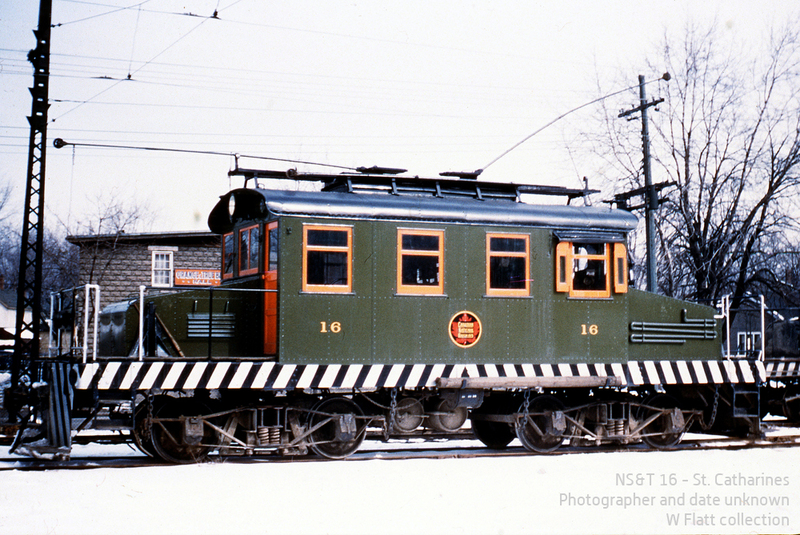 When acquired by the NS&T, this freight motor sported the same body configuration as Number 17 (below), but the NS&T rebuilt Number 16 in 1930, giving it a new cab with a distinctive four-window side arrangement. I’m not sure why this was done. NS&T 17 is also from the National Steel Car class of 1918. 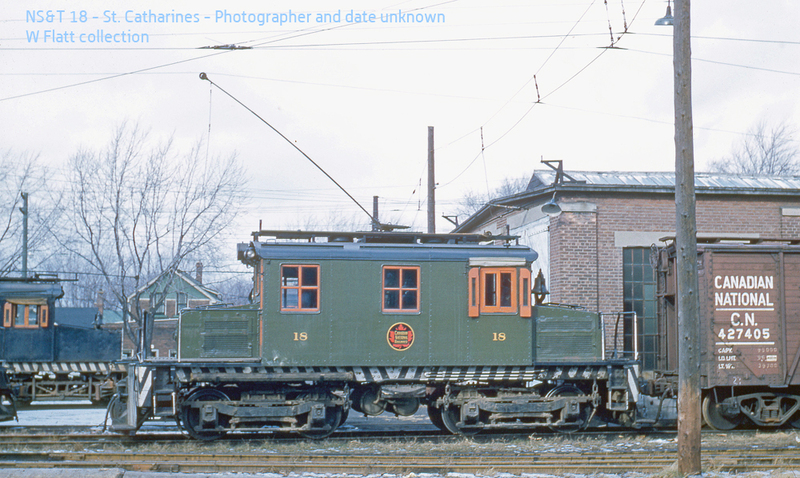 It was originally Queenston Construction Railway #E-9. Number 17 was 35 feet long and weighed 50 tons. I love the design of this freight motor, and I’m glad I have photo etches and detail parts to build it. Number 18 is a classic Baldwin Westinghouse freight motor design. B-W built this 55-ton unit for the Auburn & Syracuse Railway in 1918. 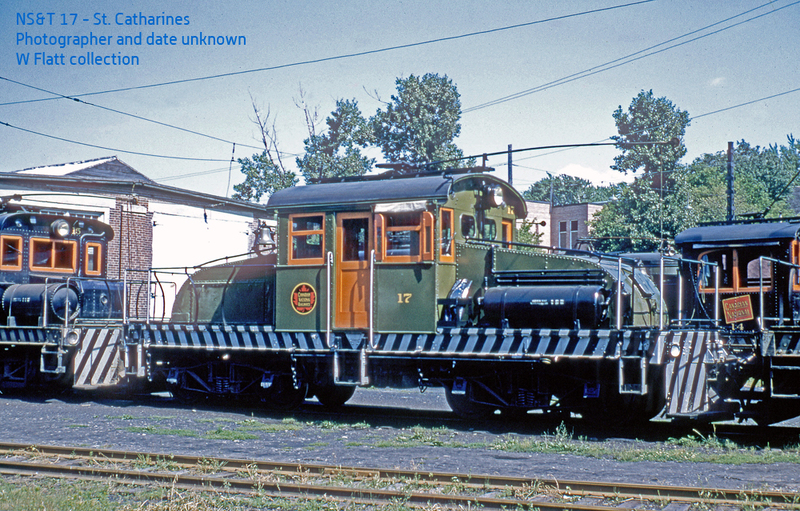 The Queenston Construction Railway acquired it, second hand, a year later, and it became #E-21. It was reassigned in 1924 to the Toronto & York Railway as that line’s Number 2, and acquired by the NS&T in 1927. I also have photo-etch and detail parts to build this freight motor. The revised John Mills book on the NS&T includes a chapter (18) on the Queenston Power Canal Construction Railway. It notes the canal was 8.5 miles long and its construction required the displacement of nine million cubic yards of earth and four million cubic yards of rock. The railway had 24 electric locomotives (plus a number of steam engines), plus about 250 air-operated dump cars. The overhead wire was off-centre, so electric locomotives were each fitted with four trolley poles. They also carried heavy duty air compressors and larger than usual air tanks, because in addition to needing air for braking, they also supplied air to operate the dump cars. When the CNR shut off the power on the NS&T overhead in 1960, all three locomotives transferred to the Oshawa Railway. From there, they took diverging routes. Number 16 went to Noranda Mines Ltd in 1965. Number 17 was scrapped in 1964. And Number 18 went to the Connecticut Electric Museum at Warehouse Point in 1965. 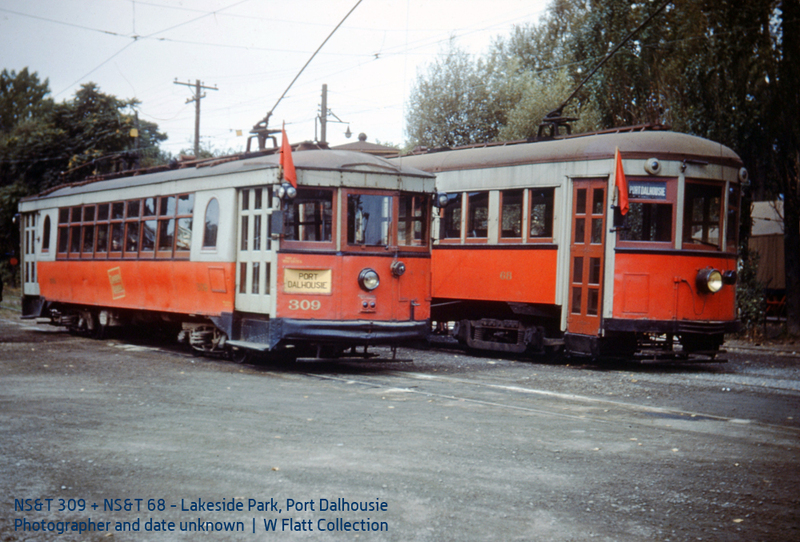 NS&T 309 and NS&T 68 – Lakeside Park, Port Dalhousie. Photographer and date unknown. 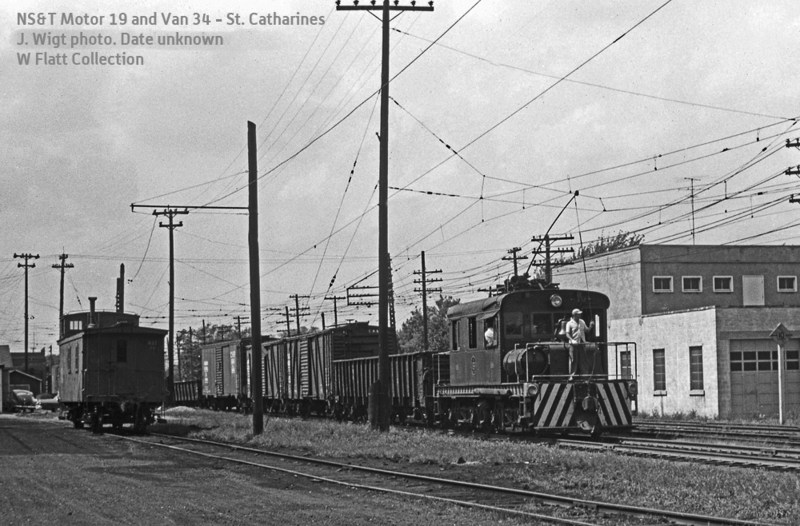 The Port Dalhousie Division was considered part of the St. Catharines local lines – but it presented many challenges to the NS&T. Lakeside Park was popular during beach season, meaning there was heavy seasonal traffic. In addition, a dance hall in Port Dalhousie generated a lot of riders. John Mills notes in his revised book on the NS&T that trains were often run as “doubles” (two cars running close together, on the same schedule), and that during peak Port Dalhousie season, up to six sections could use the same schedule. By 1940, the NS&T decided to run the division using standard railway operating rules, with green flags for advanced sections, white flags for extras, and – of course – red flags or markers bringing up the rear. NS&T 309 is a Cincinnati car, in the 301-312 series. 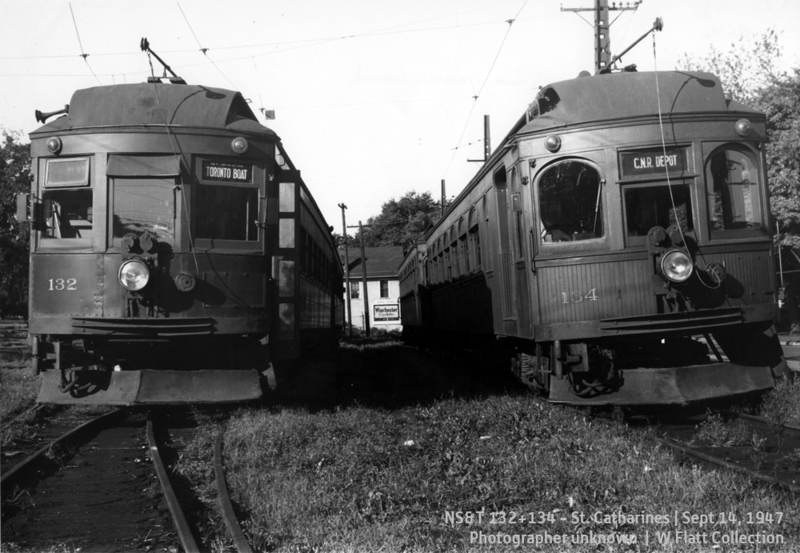 The presence of Cincinnati cars on this line suggests the photos were taken after 1947, as that’s when they were pressed into service to the Port after the CNR transferred the NS&T’s 320-series cars to Montreal. 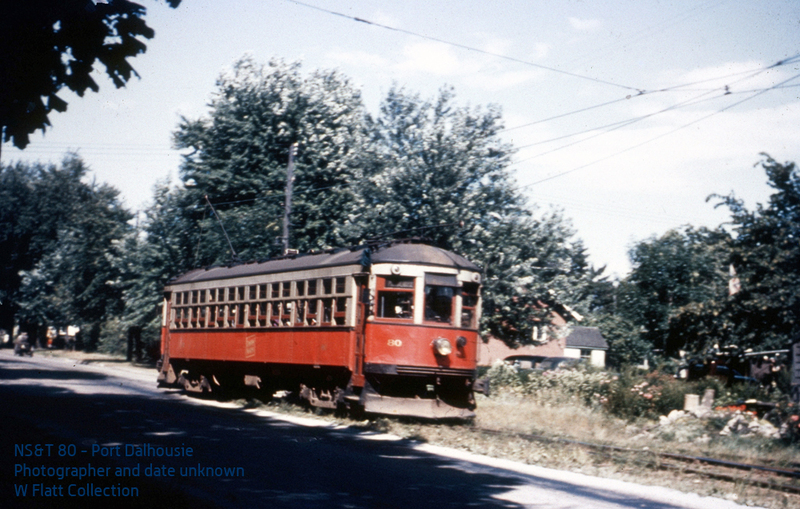 The Cincinnati cars did not track well on open track work, such as the stretch between Port Dalhousie and Woodruffs, and frequently derailed. The NS&T had better luck with 68 – a Preston product built for the London & Lake Erie in 1908 and acquired by the NS&T in 1920. NS&T 68 was 51 feet long, weighed 34,380 pounds, and sat 54 passengers. 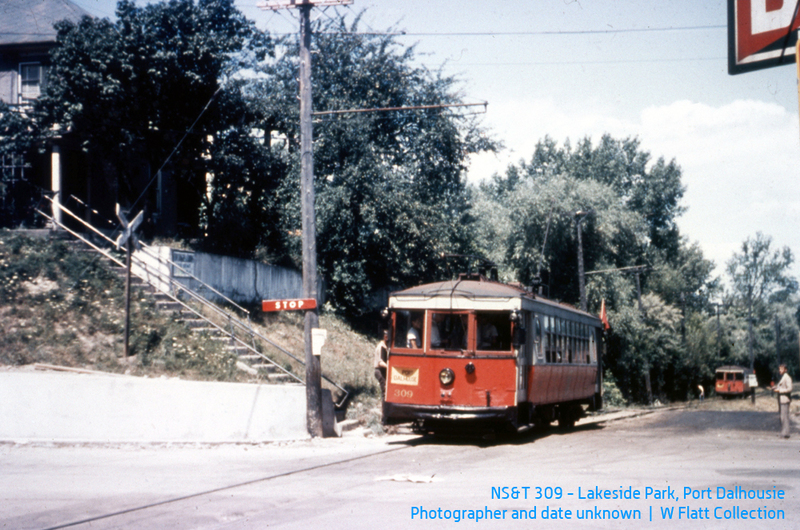 NS&T 309 – Lakeside Park, Port Dalhousie. Photographer and date unknown. NS&T 309 is just leaving Lakeside Park. It’s about to cross Lock Street in Port Dalhousie and run southwest along Main Street. 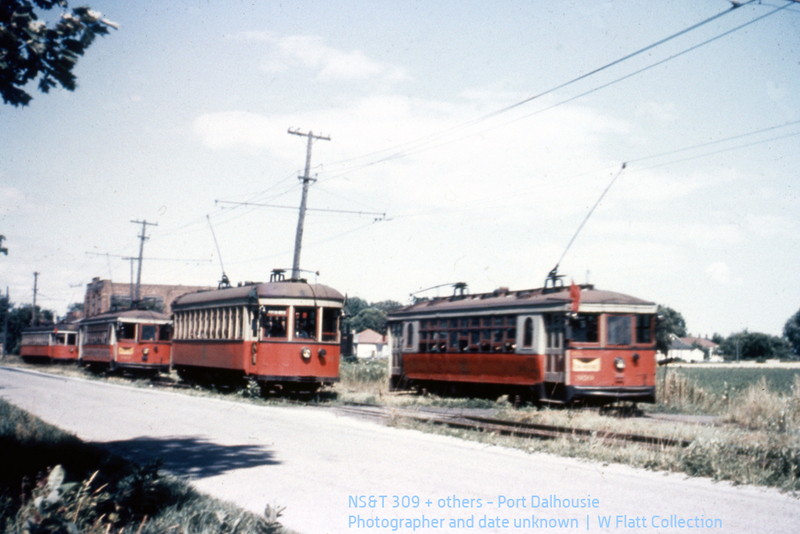 NS&T 80 – Port Dalhousie. Photographer and date unknown. Further along Main Street, NS&T 80 is headed out of the centre of the road and onto private right of way. Here, there was a siding known either as Corbetts or the Canning Factory siding. This was on the southeast side of the road and the start of the siding can just be seen at lower right. NS&T equipment – Port Dalhousie. Photographer and date unknown. This photo was taken further west on the canning factory siding. Car 309 – at right – is headed towards Lakeside Park in this image. Ahead of it, at the left edge of the photo, is another car heading to the Port. 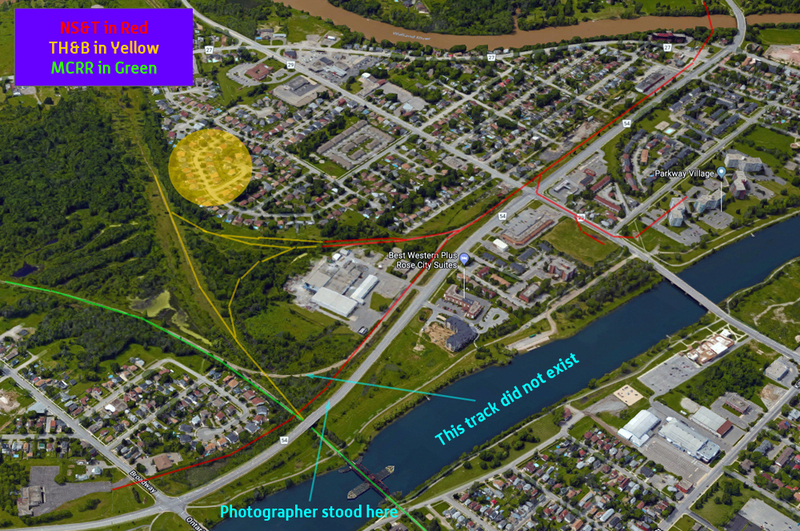 They’re meeting two cars – including a Cincinnati curved side in the 301-312 series – making the return trip to St. Catharines on the track closest to the photographer. The two cars that are not Cincinnati products could be NS&T 327 and 328. They are known to have covered the Port Dalhousie Division, and they do not appear to have integral classification/marker lights above the end windows. NS&T 327 and 328 were built by Preston in 1914 for the Edmonton Radial Railway. From there, they went to the Oshawa Railway as that line’s 80 and 81. At some point, the Oshawa Railway converted them into tool sheds – and it could’ve been their fate to rot in place. But World War II placed new pressure on the NS&T, and to satisfy the demand these two cars were acquired from Oshawa in 1943 and returned to active duty with motors and parts from NS&T 62 and 64. They were scrapped in September 1950. 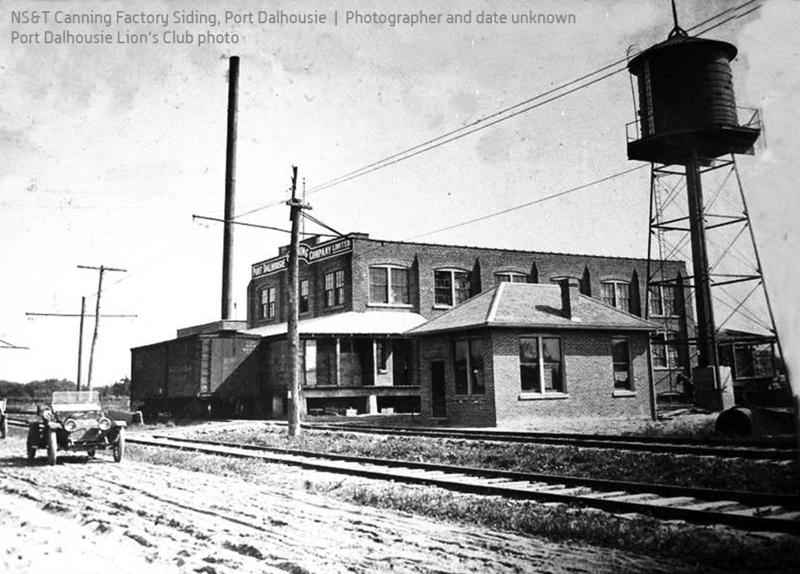 The brown building at the left of the photo, behind Cincinnati car, is the Port Dalhousie Canning Company. According to a history of Canadian Canners Limited by Louise Elder, this factory was built in 1913. It packed strawberries, raspberries, cherries, tomatoes, peaches, pears, plumbs, tomatoes, pumpkins and apples under the “Harbor” and “Harvest” labels. Two views of the Port Dalhousie Canning Company Ltd. Photographer and date unknown. 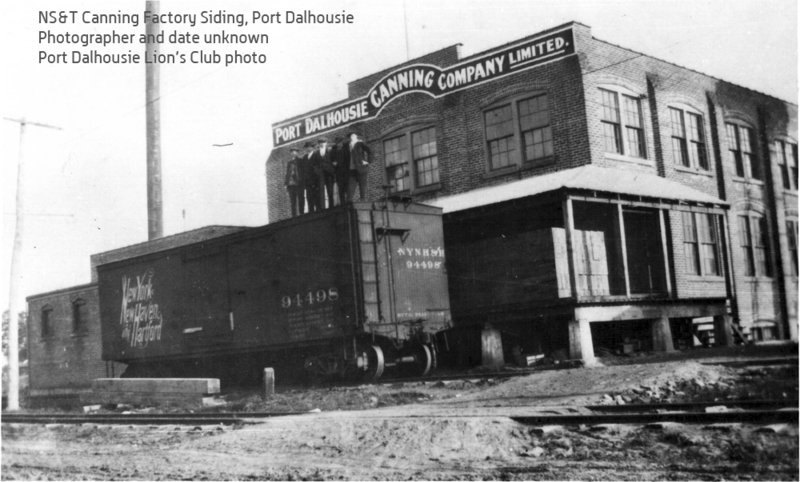 The Port Dalhousie Canning Company was purchased by Dominion Canners Ltd in 1923, but DCL used it only for storage. DCL sold the facility to the Port Dalhousie Lions Club in 1952. The club has since built a new hall at 201 Main Street, the site of the original canning plant. 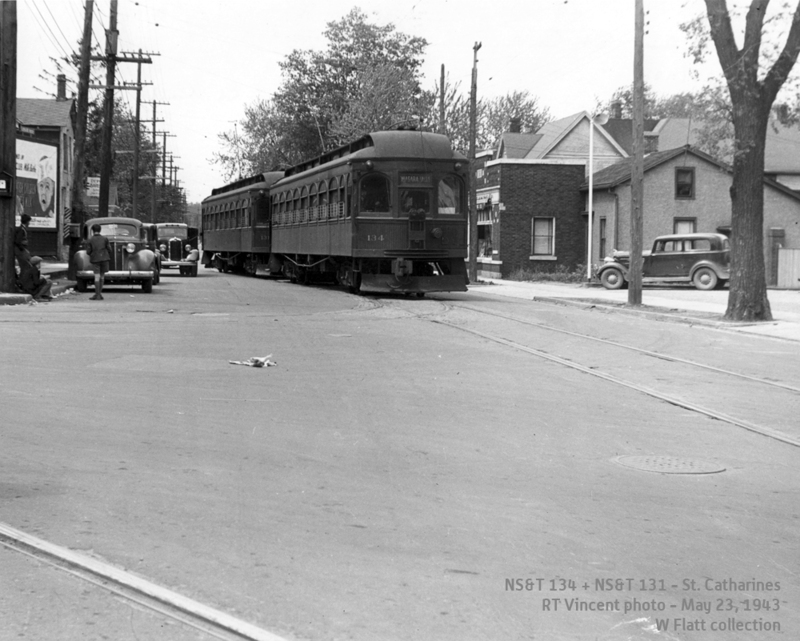 NS&T 134 and 131 – St. Catharines, May 23, 1943. RT Vincent photo. I do like these big wooden cars in the 130 series. At this time, they would be operating in boat train service from Port Dalhousie East (on the Grantham Division) to Niagara Falls. Here, they’re on Welland Avenue at Geneva Street, heading east towards the photographer from the NS&T car barns a few blocks to the west. They’ll shortly reach the terminal, behind the photographer and on the right (north) side of Welland Avenue, to begin their working day. It’s easy to identify the building with the peaked roof, at left, in both photos. The buildings to the right of the interurban have been torn down: They would’ve been just behind the car in the left-turn lane. NS&T 132 and 134 – St. Catharines, September 14, 1947. Photographer unknown. The photographer is looking west at the open yard tracks. Welland Avenue is to the right, while the building visible between the cars is on Court Street. Both of these cars were originally built by Preston in 1914, as combines. At some point, Car 132 was rebuilt for single-operator service and clad in steel, with its upper sash windows plated over. I don’t have a date for that retrofit, but the revised John M. Mills book on the NS&T includes a photo of Number 132 in steel taken December 1939 donut was prior to that. Car 132 was scrapped in April 1949, while Car 134 met the scrapper in 1950. 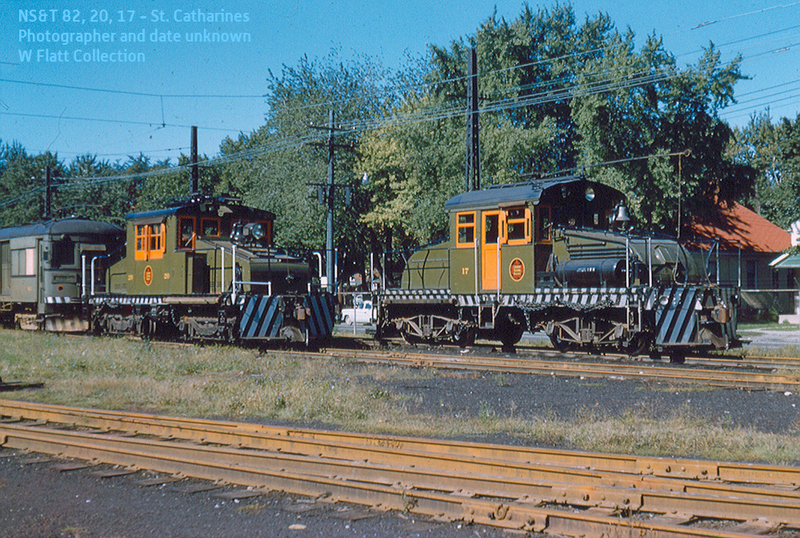 NS&T 82, 20 and 17 – St. Catharines. Photographer and date unknown. The photographer is standing near the front of the car barn at the east side of the yard, shooting northwest. Welland Avenue is on the other side of the fence, behind the equipment. I do like the paint scheme on these three units. While it’s a standard CNR green, the window frames and doors on the freight motors are nicely picked out in orange – and those black and white sills and pilots sure eye-catching. Number 82 can barely be seen at the left (west) side of the photo. This car was built by the NS&T in 1925, for the Toronto Suburban Railway. It uses a standard underframe designed by CNR for its self-propelled diesel electric rail motors. As built, the car seated 72 passengers, was 61′-9″ long, and weighed 80,000 pounds. Sharp-eyed readers will note it has a baggage door in its side. Car 82 was rebuilt in 1956 as an express motor. It was scrapped in 1959 – so that narrows down the year for this photo. As mentioned previously on this blog, NS&T 20 was built by General Electric in 1914 as South Brooklyn Railway #6. The NS&T acquired it in 1938 in a trade with a dealer in Toronto. It was a 55-Ton steeple cab, which was scrapped in 1960. A few years ago, I acquired a photo-etched kit for this locomotive designed by William, so it’ll definitely show up on any layout I build. I also have a photo-etched kit from William for NS&T 17 – a handsome freight motor with pronounced curves on the ends of its hoods, and cab-side doors. Number 17 was a 50-ton freight motor built by National Steel Car in 1918 for the Queenston Power Canal Construction Railway as that line’s number E-9. It was one of two freight motors acquired by the NS&T from the construction railway in 1926 – the other being the NS&T’s second Number 16. While the second 16 was rebuilt with a new cab in 1930, the 17 retained its original configuration. 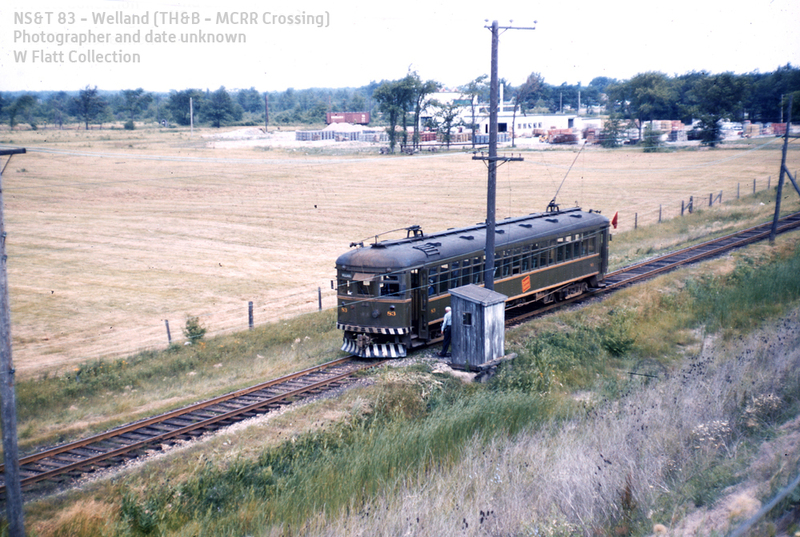 Number 17 was transferred to the CNR’s electric line in Oshawa, Ontario when the NS&T converted to diesel in 1960, and was scrapped in 1964. As I ponder possible scenes to include on a layout, the Welland Avenue yard and car barn is tempting. That said, if I end up not building a layout (still a possibility), it would make a nice diorama – a great place to display the variety of equipment once owned by the NS&T. I’ve been reading through the revised book by John M. Mills on the Niagara St. Catharines & Toronto Railway, and it’s raised some questions about power distribution for the line. 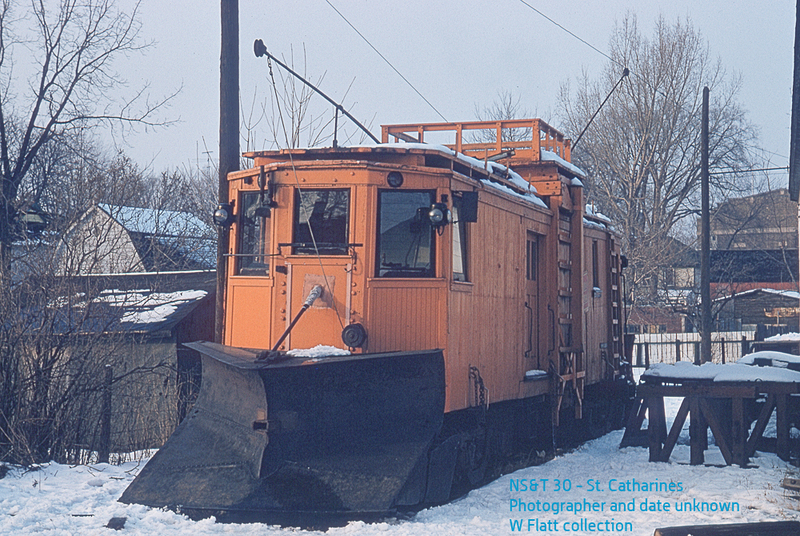 NS&T 30 – “Line Car Spur”, St. Catharines. Photographer and date unknown. Most of the photos I’ve seen are of the building in the centre of the wye at Substation Junction, in Thorold. I’ve never seen a photo of the substation in St. Catharines. I was curious about its location, so I went exploring. 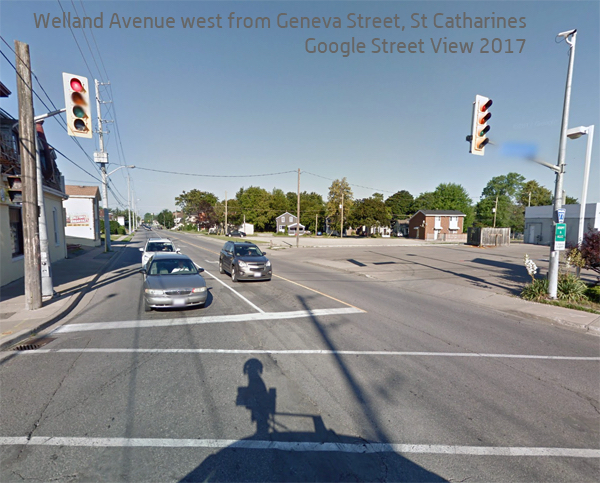 My first theory – which was based on no evidence – was that the St. Catharines substation was located on the north side of Welland Avenue, must east of Court Street. This would place it across the street from the car barns, which backed against that street. 1923 St. Catharines Fire Map. From the Brock University online collection. A-ha! There it is – the orange-coloured building in the lower right corner. That places it in the V formed by Welland Avenue and Niagara Street. Now – does anybody know of any photos of this building? If you share any of the photos I’m sharing, can you please include the URL to the original post? I’m really pleased by the response to my various posts, and I’m happy that some people are even sharing some of the photos – for example, on Facebook groups dedicated to the history of the various communities that the NS&T served. That’s wonderful! 1 – I spend a lot of time – a couple of hours per post – researching the equipment and the location. I’m trying to provide context – this is history that I’m trying to preserve. If you share the photo but don’t share the link, those who see the picture on Facebook won’t know there’s more to the story. 2 – I’m doing this for free. I’m not playing “I have a secret”, as some people with photo collections do. I’m not trying to make money from the pictures. But I do want something in return: I have questions about the photos, the NS&T, its operations, and so on. 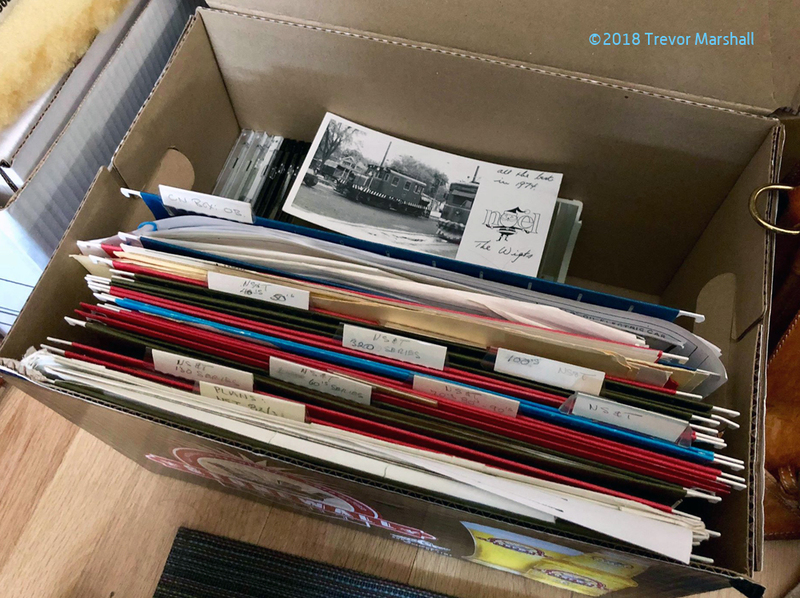 What I get out of sharing these photos is not only an opportunity to organize the material in my own mind, but also the chance for others – who know more about the subject than I do – to contribute their knowledge. But they can’t do that if they don’t know about this blog. This is not a give-and-take, where I give and others take. It’s a collaboration. I want information from those who have it, and putting the pictures online is one way I hope to obtain it. In the end, we all win. NS&T 83 – Welland. Photographer and date unknown. NS&T 83 has stopped at a telephone shack just north of the interurban’s level crossing with both the Toronto Hamilton & Buffalo Railway and the Michigan Central Railway (the New York Central’s operation connecting Buffalo and Detroit across southern Ontario). The crossings are out of the frame to the left, and the motorman (or possibly, the conductor) is returning to the car after phoning for permission to cross the railways so 83 may continue its trip south to Port Colborne. The photographer is standing on Prince Charles Drive, facing northwest. In the background, the large industrial complex is Vesuvius Canada, which makes clay graphite crucibles for melting steel. According to the corporate history, the company has been around since 1916, although I don’t know when it set up shop on this site. It is still in business today. To the left of Vesuvius, a Wabash boxcar is parked in the interchange yard between the NS&T and the TH&B. 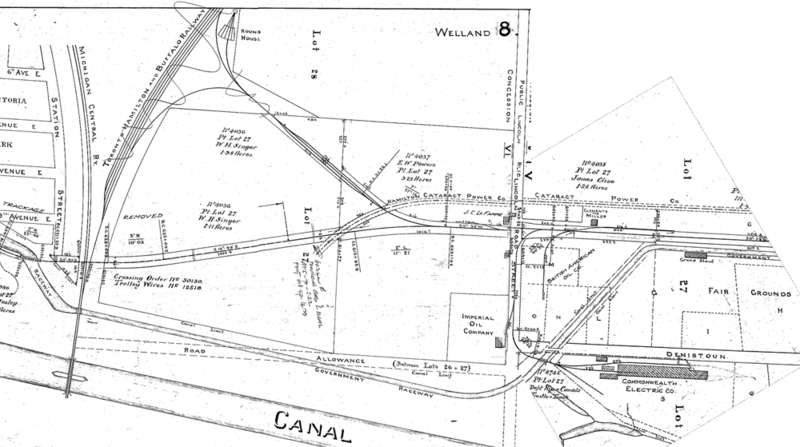 NS&T Property Plan 1920 (revised CNR 1948) – Welland, Ontario. Welland from the air (Google Earth) showing NS&T, TH&B, and MCRR. 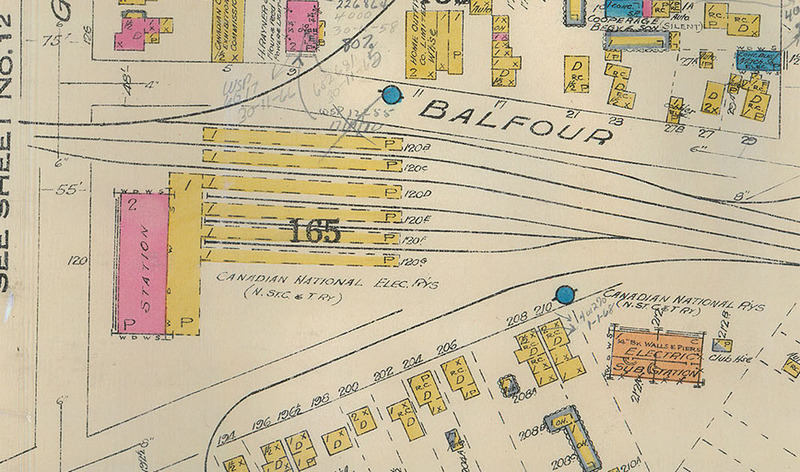 The yellow dot is the approximate location of the NS&T roundhouse and turntable noted on the Property Plan. Also, while not relevant to the photo of 83, I’ve sketched in the spurs to Imperial Oil and Commonwealth Electric. The TH&B’s own trackage ended at the MCRR connection. It used MCRR trackage to reach Niagara Falls, where it crossed into the United States then headed south to Buffalo. With three lines converging and an elevated view from Prince Charles Drive, there are several photos of NS&T cars actually crossing the TH&B and MCRR, but this is one of the few I’ve seen that provides such a good view of the phone box. 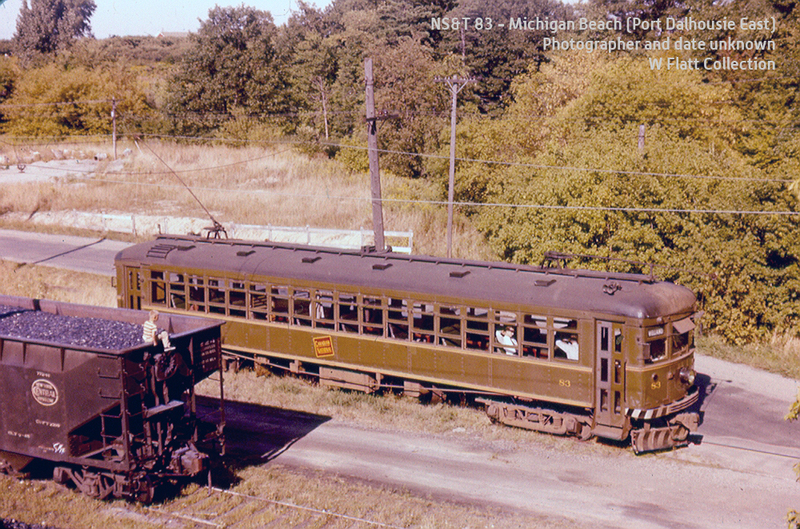 NS&T 83 – Michigan Beach. Photographer and date unknown. Based on other photos taken of this car at this location, I’m pretty sure the date of this photograph is September 8, 1957. Car 83 is on an enthusiasts’ excursion trip on what is normally, by this time, a freight-only line. Where the heck is Michigan Beach, you ask? It’s another name for the east side of the basin where 12 Mile Creek and Martindale Pond empty into Lake Ontario. It was also called Port Dalhousie East, as the boats from Toronto would exchange passengers here with NS&T Main Line trains to Niagara Falls, before turning in the basin to dock at the west side at Port Dalhousie, where Lakeside Park is located. NS&T 19 – St. Catharines. J Wigt photo. Date unknown. 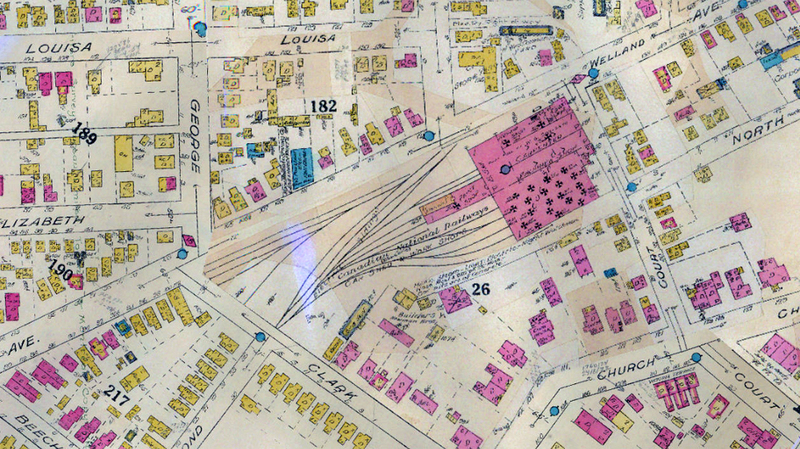 1923 St. Catharines fire map, showing (left to right) the NS&T passenger terminal, the Niagara Street freight house and team track yard, Page Street, John Street (now Tasker Street), and Haynes Street. From the Brock University online collection. The van (caboose) is NS&T 34. I don’t have too much information on the vans used on the NS&T, but it appears to carry a CNR Maple Leaf on its side. I do know that CNR vans had to have the stove grounded before they were safe to use on the NS&T, so they tended to stay on the property. The van is standing on a spur that is identified on my 1923 fire insurance map as serving Monarch Knitting. This picture also appears in the second book by Andrew Panko and Peter Bowen, and it’s noted that this spur was frequently used to store idle vans. Enter your email address and click the "Yes, Please!" button to subscribe to my blog. Your will receive notifications of new posts by email. Port Rowan in 1:64 My S scale home layout, depicting a CNR branch line terminal in southern Ontario, in its twilight years. Brock University Library – Air Photo Collections A terrific resource for exploring the NS&T and the communities it served. NS&T Book: John Mills Essential reading for anybody interested in this railway. Published by Railfare DC Books. NS&T Facebook Group This group shares lots of interesting photos – past and present. NS&T History A fine overview, with photos, on the Transit Toronto website. NS&T on DVD: GPS Video This company publishes a 60-minute DVD called “Niagara St. Catharines and Toronto Railway – The Little System That Could”. NS&T Photos A selection of photos from the Niagara Railway Museum. NS&T Photos: Freight Motors A selection of pictures from Don’s Rail Photos. NS&T Photos: Non-Revenue Equipment A selection of pictures from Don’s Rail Photos. NS&T Photos: Passenger Cars A selection of pictures from Don’s Rail Photos. Northwest Short Line NWSL’s components are useful for many projects. For the NS&T in particular, the Stanton Drive power trucks are essential. Steam Era Models Maker of the Black Beetle line of power trucks, which are essential for traction modelling.